It has been nearly 15 years since Freddy vs. Jason gave us all the horror showdown that fans had been waiting a very long time for. It's hard to say if the entire movie lived up to expectations, but it remains a high point financially for both the Friday the 13th and the Nightmare on Elm Street franchises. Even though the movie came out in 2003, there had been plans to make Freddy vs. Jason for years before that. This is evidenced by a sales trailer from 1997 that New Line Cinema put together to try and help hype up the planned horror showdown. 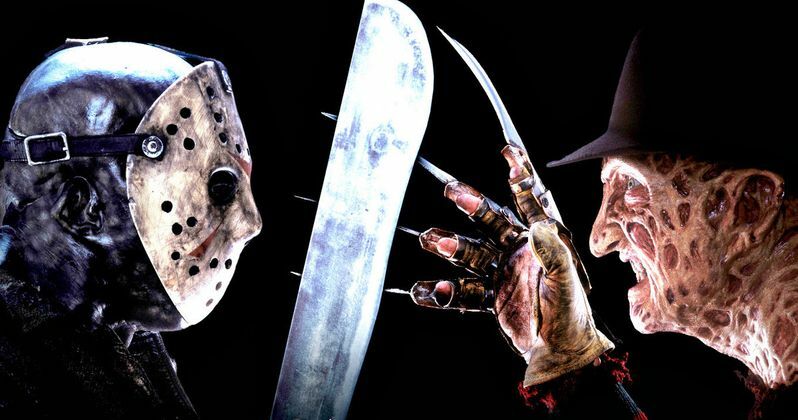 The rare video was uploaded by YouTube user José Mellinas and gives us a look at how New Line envisioned Freddy vs. Jason in the years before it actually got made. Even though the trailer is very 90s, featuring a big ominous voiceover with some cheesy text slowly crawling toward the screen, it is actually pretty effective. The whole thing culminates with a bunch of quick cut scenes of some memorable sequences from both the Nightmare on Elm Street and Friday the 13th franchises. At the time that this sales trailer for Freddy vs. Jason was put together, it had been roughly ten years since the initial idea to have the two horror legends square off against one another. In 1997, when this was released, it was actually makeup and special effects legend Rob Bottin, who worked on The Thing, who was attached to direct. His vision ultimately didn't come to pass as Ronny Tu was the man who finally made this movie happen. The "showdown of the millennium," as promised in this trailer, wasn't what many had hoped it would be. Maybe that would have been different if someone else had tackled it in the years prior. Jason Goes to Hell initially set up the showdown that would come to pass in Freddy vs. Jason. The 2003 horror crossover has its issues, but it is the last time to date that Robert Englund put on the sweater and took up the mantle of Freddy Krueger. As for Jason Voorhees, Ken Kirzinger had the honor of swinging his machete around in Freddy vs. Jason, which marked the first time that Kane Hodder hadn't played the part since Friday the 13th Part VI: Jason Lives. Freddy vs. Jason was not a critical success, to say the very least. The movie currently holds a 41 percent approval rating from critics on Rotten Tomatoes and a pretty measly 50 percent audience rating. Freddy vs. Jason was a huge box office hit. The movie made $114.9 million at the box office, making it the highest-grossing Friday the 13th movie and the second highest-grossing Nightmare on Elm Street entry. There was some talk of a sequel, but it never came to pass. Be sure to check out the Freddy vs. Jason sales trailer for yourself below.